In 1791, local Ohlone artists painted a 20′ x 22′ mural on a wall of the sanctuary at Mission Dolores. Currently, however, that mural is hidden behind a massive 1796 reredos, or wooden altar. 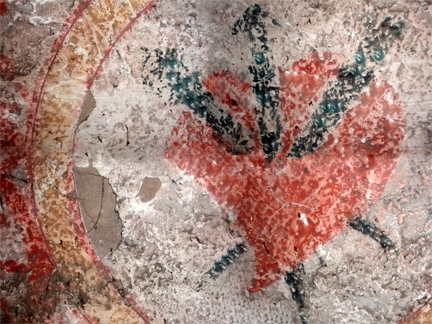 In 2004, artist Ben Wood and archeologist Eric Blind devised a means to digitally photograph a 5′ x 22′ portion of the mural without moving the altar – a project that earned them the 2004 Governor’s Historic Preservation Award. Now, Wood is overseeing a project to recreate that portion of the mural in a public setting a few blocks away. Wood consulted Annice Jacoby’s 2009 publication, Street Art San Francisco: Mission Muralismo, and found the names of artists Megan Wilson and Jet Martinez – both of whom have been active in the Clarion Alley Mural Project. Martinez was interested Wood’s proposal to recreate the Mission Dolores mural, and had already been in communication with Jeremy Shaw, Executive Director of the Mission Community Market, about the possibility of creating a mural on the wall of Mission Market at 85 Bartlett Street (between 21st and 22nd Streets). The Mission Community Market (MCM) is a nonprofit that began in 2010 as part of the San Francisco Planning Department’s Mission District Streetscape Plan. It organizes a weekly open-air farmer’s market at Bartlett and 22nd Streets that also provides a venue for local Mission businesses and arts and youth organizations. Shaw had been meeting with neighborhood business owners about the possibility of putting murals on the walls around the MCM. Martinez, Wood and Shaw felt that a recreation of the Mission Dolores mural would be an appropriate beginning for a larger mural project in the area. The owner of Mission Market was amenable to having the mural painted on the outside of his store; and through Megan Wilson, Ben Wood met two other local artists – Bunnie Reiss and Ezra Eismont – who, along with Martinez, signed on to paint the mural. Wood has invited Mission Dolores staff to collaborate on an interpretive panel that would accompany the mural, in the hopes of highlighting the stewardship and programming at Mission Dolores in relation to its historic resources. Wood has also consulted with Charlene Sul, Chair of the Advisory Council for The Confederation of Ohlone Peoples about the project. More recently, Wood has been in conversation with Sul’s son, Anthony, about the possibility of his participation in the painting of the mural. Through these and other Native contacts, Wood has been soliciting input about the mural’s creation, presentation, and interpretation. Wood has created a video about the project to assist in his goal of raising $8,300 by April 4. For additional information about the project, please visit the Mission Dolores Mural website. Alcatraz Welcome, 2009 photo by Jackie Sutherland. On the evenings of Wednesday, November 25 and Thursday, November 26, a series of film and still images will be projected onto Coit Tower to mark the 40th anniversary of the occupation of Alacatraz Island by a coalition of Native American activists. The project, called “Indigenous Renewal: Alcatraz Occupation Remembrance + Ohlone Presence Celebrated,” represents a collaboration of San Francisco-based artists Ben Wood and David Mark. Neil Maclean, as part of the Ohlone Profiles Project, also invited a number of other contributions from local native supporters and some Ohlone. In conjunction with the projection on Coit Tower, a running commentary about the images will be broadcast on KPOO San Francisco 89.5 FM. On November 20, 1969, a coalition of Native Americans – many of them college students – took over Alacatraz Island in San Francisco Bay in an unarmed occupation that would last until June 10, 1971. At its height on Thanksgiving, 1969, as many as approximately 400 Native activists occupied the island. Alcatraz had been abandoned as a federal prison facility since 1963, and although the U.S. Coast Guard established a blockade of the island at the beginning of the occupation and the FBI were poised to land, the federal government withheld action until the numbers of activists dwindled to about 15 in 1971. 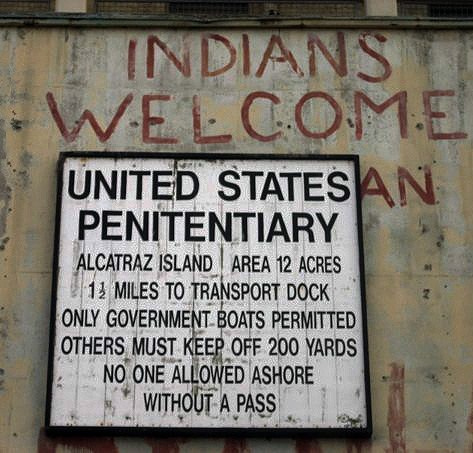 The inital occupying party, calling itself Indians of All Tribes, demanded that Alcatraz be developed as a Native cultural center, including programs such as a museum and a center for Native studies. More broadly, the activists drew attention to a wide range of Native issues related to sovereignty, repatriation and civil rights. “Indigenous Renweal” will take place on Wednesday, November 25 and again on Thanksgiving, Thursday, November 26, from dusk until the following morning. Wood and Mark have recommended Fisherman’s Wharf, Pier 31, and Washington Square as locations from which the images can be seen. Running commentary about the images from Ohlone and other Native participants in the project will be able to be heard on KPOO San Francisco 89.5 FM. For more information about the project and the artists, please go to Coit Live or Ohlone Profiles.